Reversible thermal trousers which take very little space when compressed and warm you up superbly when worn. A must-have for outdoor activity. Used British surplus. These are meant for situations where you stop moving and stand around instead, but also work as a mid-layer for really cold weather. Elastic waist & cuffs, with zippers running either along the length of the whole legs, or a generous amount from the bottom - the models vary. All of them are easy to don without removing your boots. Sometimes comes with a small stuff sack, but don't count on it. Reversible from OD to tan. 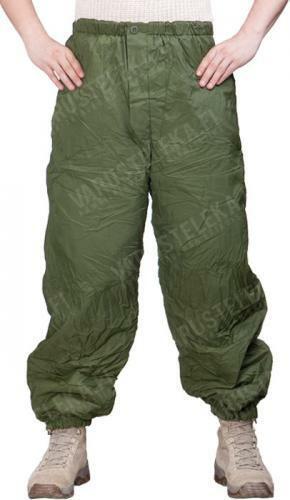 The outer is made from nylon, the filling is polyester, just like in most sleeping bags. Sizes in the US style system: Small, Medium, Large etc. As the trousers are meant to be worn on top of everything, the sizes run large. No different lengths. Used, but in good serviceable condition. Hey, look at the price of these made as a very simple design, good quality, perfect for quick wear warming trouser. Light, packable, can't go wrong ! Ihan parasta maastopuvun alla pulkkamäessä kovassa pakkasessa. Great pants, great value. However they run VERY large (one star deduction). I normally wear XL clothes and ordered these in XL, but they are waaaaaay too big even with many layers underneath. Thinking I might even need to go for an M next time they re-stock. Ovathan nämä lämpimät ja periaatteessa ajavat asiansa hyvin, eikä hintakaan ole korkea. Ongelmana on tuo kokosysteemi. Koot ovat jumalattoman isoja. Tuoteselosteessa se tietysti ohimennen mainitaankin, mutta aliarvioin ne silti. Normaalisti pidän L-Xl -kokoisia rytkyjä, mutta jopa M on näissä koissa ainakin leveyssuunnassa aivan liian iso minulle. Ehdottomasti suosittelen tuotetta itsessään, omaa hölmöyttänihän minä vaatteita sovittamatta ostan.